A lot has changed since I last blogged about the staircase project. By a lot I mean everything. First things first, the railings. The vertical vs horizontal railing debate kept us occupied for quite a while. 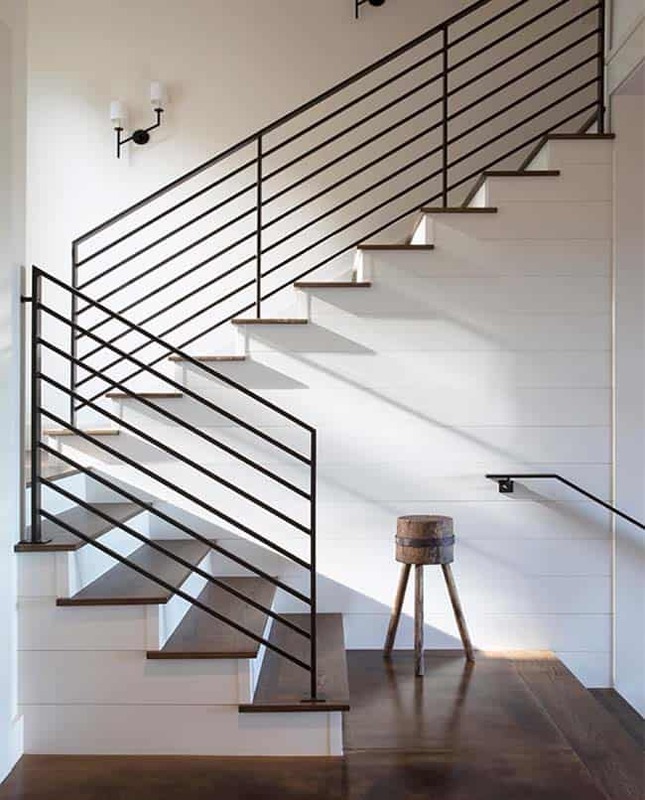 Originally, I wanted horizontal railings but then as I mulled it over and pinned staircase after staircase, I started to lean toward verticle railings. After we decided to hire out the railings, I brought in a metalworks guy and he showed me some samples. I was still torn so I mocked up both versions on a photo of our balcony and did a poll on Instagram and I’m happy to report we’ve officially decided to go with horizontal metal railings. I feel the horizontal is less busy, more modern and less traditional than the vertical. We will have a lot of railing, about 80 ft, all of which is visible from the main living area so in this case, I think simpler is better. I know some of you will say that horizontal railing is a climbing hazard but we’ve increased the height of the railing on the balcony area above code requirements to help minimize some risk. I still like both the vertical and horizontal railings but I’m going to drive myself crazy. We’ve decided so it’s time to move on and make this staircase project a thing of the past! Alright, moving on to the stairs themselves. Remember how I said I wanted to tile the risers, something like this? I’ve decided not to. I know that may come as a shock since I was so excited about it but here’s why. My #1 tile choice is hella expensive and has an 8 week lead time. Sure, I have a #2 tile choice that is a lot more budget-friendly, but I just don’t love it like I love #1. Additionally, there’s a lot that goes into tiling stair risers. Because of the thickness of the tile and the backer board it has to be attached to, it creates a lot more work in prepping the staircases (remember, we have two). Staircase work is expensive and I just can’t justify spending thousands of dollars on tile and thousands more to rework the staircase to accommodate the tile risers, on top of the thousands we’re already spending on railing, flooring and trim work. Plus, it would add 2-3 months to our staircase reno timeline. No, thank you. I was bummed at first but I’ve decided that I will use that amazing tile I love so much somewhere else in the house. We still have lots of renovating to do so I have opportunities – the kitchen, the powder room, or one of the 3 other bathrooms on the list. As for the treads (the part you step on) instead of installing solid, pre-made treads and staining them to match our existing hardwood floors, we’re just going to install tongue and groove hardwood flooring directly onto the stairs, eliminating concerns about the treads having a different grain or stain color than the flooring. There’s still some work that goes into prepping our staircase for that, but not near as much and our flooring guy can do it all. So, like I said, everything has changed with regard to our staircase project. Sometimes ya just have to adjust and figure out what works best with your budget and timeline and go with it. I’m pretty confident with the decisions we made and can’t wait to wrap this project. Metal fabrication for the railings should start soon and the flooring and trim work is on the schedule for later this month. I plan to do a more thorough post on the process and expense of the metal railings so stay tuned.